997.1 GT3 Cup Rear Composite Bumper. 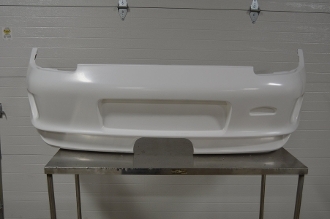 This is the correct bumper for the 2006 - 2009 GT3 Cup cars. This will also work on street cars that are looking to go to a center out exhaust. STORE WILL NOT CALCULATE SHIPPING. Shipping charge is approximately $175 to your door depending on your location. You may place order on line and we will contact you about shipping.